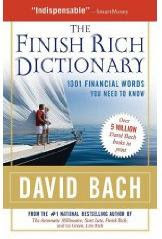 David Bach has been kind enough to send us a copy of his new book The Finish Rich Dictionary: 1001 Financial Words You Need to Know published by Oxford University Press. In this book David has demystified the language of commerce by giving detailed explanations of 1001 essential financial words. In addition he has provided ten helpful essays about some important yet befuddling topics in the arenas of finance and money. One particular case study that caught our attention was a real life experience from David's life whereby he counseled a lady who was buying IRAs. Yes you read it right - it's indeed about buying IRAs! Many people think that they can buy IRAs like CDs. The illusion is that an IRA is an investment like a CD and not an account in which investments are held. It might appear dumb but there are people who are not well versed with the language of money and investments and fall prey to such delusions. David Bach, you don't know what you are talking about. I've been buying IRAs at the local bank for ten years!" Later, when David investigated Glenda's case he found that she had opened a new IRA account every year for the previous ten years at her bank! And since she had not given any specific directions, the bank had put her money (which she had put in her new account each year) into the lowest available yielding investment which earned her a meager 2 percent per annually. Glenda's ignorance about IRAs and the language of money in general made her pay a heavy price for ten years! We found some new and interesting financial terms like Balloon Payment, Keiretsu, Pyschic Income, Sharpe Ratio, Seige Economy, Silent Partner, and Zaibatsu. In addition, we read several definitions which shed new light on complicated terms which we were aware of but not clear about what they really meant. David has also added simple plain English meanings for complex terms (with statistical formulas) and this is really a life saver. In a nut shell this book is a great reference for those of us playing the money game. After all we should be clear about a game's rules and terminology before we play it. This will help us to improve our chances of winning the game else we will be taken for a ride like Glenda! David Bach is one of the best known financial writers of all time. He has authored several top sellers like "The Automatic Millionaire" and "Start Late, Finish Rich." His books have been translated into fifteen languages and there are over five million copies of his books in print worldwide. David lives in New York City and is a regular contributor to Yahoo Finance and Redbook Magazine. Yikes! That IRA story is scary -- makes me want to double-check all my finances, too. I think it's good to learn a little about lots of different topics, but it's probably better to be really well-versed in just a few. Perhaps the star of the IRA story also knew a tiny bit about half a dozen other tax-advantaged accounts, instead of understand the one that was right for her well enough to use it. I love his books, great author and good insight! Haven't read this one though. Reading your post it seems to me that it will be a good gift for young adults stepping into the real world and investing. We acquiesce that we need to clearly know the terms that we are using. Rest of the stuff can be learnt as and when necessary. You are right, newbies need to check this book out to get their basics straight. Though it sounds funny.. It is very real. I have seen many relatives not knowing the correct meaning of the terms. It happened with me too, when I wanted to know about stop loss in my stock trading. I myself and many friends did not have a clue as to how to use a stop loss. The broker was not able to understand what we knew. Finally I learned through online forums where similar people were discussing. A book to clear all such terms will be very essential for everyone involved with finance.